The Open Group's Future Airborne Capability Environment (FACE™) standard has emerged as an alternative to traditional development, promoting more cost-efficient, reusable, modular, standards-based applications ready for flight in both manned and unmanned airspace. 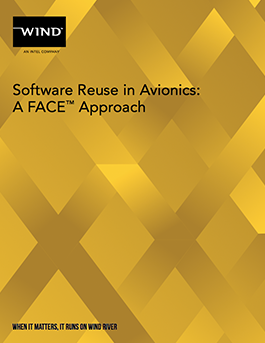 FACE ensures that conformant software follows the group's technical standard and can be used—and most importantly, easily reused—by suppliers of avionics systems across different projects. VxWorks® 653, the industry-leading avionics platform for delivering safety-critical, integrated modular avionics (IMA) applications, is the first real-time operating system to be certified conformant to the FACE Technical Standard Operating System Segment (OSS) Safety Base Profile supporting all ARINC 653 and POSIX® capabilities required by the FACE Conformance Test Suite.